This unusual name may well have an equally unusual and rare origin. It is believed to derive from the Olde English "Ern or Arn" meaning "The Eagle" and "Leah", an enclosure or fenced farm, i.e. "the dweller at the Farm of the eagle". As "Eagles" are rare in England, it is possible but unproven that the name is of Yorkshire origin, Thomas de Arneclif (Eagles Cliff) being recorded in the Kings Rolls of Yorkshire in 1207. The name in its "modern" spelling has a long recording, in fact it is rare for a name to hold its spelling for some 400 years. The name development includes Richard Antley christened at St. Andrews, Holborn on April 26th, 1752 and Harriot Antley recorded at St. Mary Le Bone on June 2nd 1795. 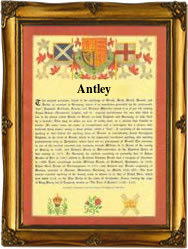 The first recorded spelling of the family name is shown to be that of John Antley, which was dated 1561, Married Margaret Morte at St. Bartholomews, London on November 9th, during the reign of Queen Elizabeth I, "Good Queen Bess", 1558 - 1603. Surnames became necessary when governments introduced personal taxation. In England this was known as Poll Tax. Throughout the centuries, surnames in every country have continued to "develop" often leading to astonishing variants of the original spelling.